This article is about the Nintendo character. For other uses, see Yoshi (disambiguation). Yoshi[a] is a fictional anthropomorphic dinosaur who appears in video games published by Nintendo. Yoshi debuted in Super Mario World (1990) on the Super Nintendo Entertainment System as Mario and Luigi's sidekick. Yoshi later starred in platform and puzzle games, including Super Mario World 2: Yoshi's Island, Yoshi's Story and Yoshi's Woolly World. Yoshi also appears in many of the Mario spin-off games, including Mario Party and Mario Kart, various Mario sports games, and Nintendo's crossover fighting game series Super Smash Bros. Yoshi belongs to the species of the same name, which is characterized by their variety of colors. Considered after the development of Super Mario Bros., Yoshi's early design differs greatly from his finished appearance. Shigeru Miyamoto stated that Nintendo had wanted Mario to have a dinosaur companion ever since the first release of Super Mario Bros.; however, it was not possible because of the limitations of the NES. The inspiration for Yoshi can be traced back further, to the green dragon Tamagon in the 1984 video game Devil World: both are green lizards that hatch from eggs and can eat enemies with their large mouth, and also emit the same noise when they hatch. During the development of Super Mario Bros. 3, Miyamoto had a number of sketches around his desk, including an image of Mario riding a horse. Takashi Tezuka, a Mario series developer, speculated that Miyamoto's love of horse riding as well as country and western themes influenced Yoshi's creation. The concept of Mario riding a dinosaur also came from the NES video game Excitebike, which featured people riding motorcycles. He again wanted to feature Yoshi in Super Mario Bros. 3, but was still unable to. 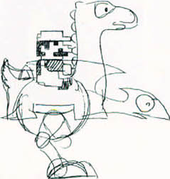 Tezuka designed two power-ups (the frog suit and racoon tail) to make up for this limitation. Once the more powerful Super NES was released, Miyamoto was finally able to implement Yoshi into the series, putting Yoshi into the video game Super Mario World. Yoshi proved to be popular in this debut, which caused the next game in the series, Super Mario World 2: Yoshi's Island, to focus on the Yoshi species. The version of Yoshi seen in the Super Mario Bros. film was made using a 0.91-metre-tall (3.0 ft) animatronic dinosaur. Yoshi was designed in the film by Dave Nelson. The animatronic had nearly 60 metres (200 ft) of cable and hundreds of moving parts inside of it, and was controlled by nine puppeteers. The body was cable-controlled, while the head was radio-controlled. Nelson described the overall process as being "difficult." The creation of Yoshi was handled by a company independent from the filmmakers. Yoshi has a variety of abilities that stand out relative to other characters in the Mario series. Yoshi's prehensile tongue can extend a considerable distance to grab distant objects or access otherwise out-of-reach areas. After grabbing objects, Yoshi may swallow the object to produce a distinctive spotted egg, which can then be thrown; eggs are in fact the primary "logo" of Yoshi in multiplayer games. Another signature technique is the "Flutter Jump" which extends the duration of a jump and slows Yoshi's descent. Like Mario, Luigi and a few other characters, Yoshi is also a noted user of the "Ground Pound", which involves dropping bottom-first after a jump in order to destroy blocks or damage opponents. Yoshi's large nose unsurprisingly allows for the detection of hidden collectibles as well as flowers by smell and, as demonstrated in the Super Smash Bros. series, may be used as an offensive weapon. The Yoshi species appear in a variety of colors. This is generally a cosmetic difference used to differentiate individuals. However, in some games, the color of a Yoshi provides additional abilities: in Super Mario World red Yoshis can breathe fire, blue Yoshis have wings, and yellow Yoshis produce damaging dust clouds on landing. In other games eating fruit changes a Yoshi's color and provides an ability: orange, pink, and purple Yoshis in Super Mario Sunshine can spit fruit juice to defeat enemies and create platforms; while Yoshi can turn red, light blue, or yellow in Super Mario Galaxy 2 upon eating fruit and respectively attain super speed, the ability to inflate like a balloon, or the ability to produce a platform-enabling glow. Yoshis of various colors appear often in multiplayer games as alternate choices which may or may not have specific stats. In Super Mario World, Super Mario Sunshine, New Super Mario Bros. Wii, Super Mario Galaxy 2, and New Super Mario Bros. U, bongos and other appropriate percussion instruments are added to the level's background music whenever a player rides Yoshi. Also, in New Super Mario Bros. U, a choir is added to the level's background music whenever a player is holding a baby Yoshi. While being ridden, Yoshi acts as an extra hit point; taking damage will cause either Mario or whoever is riding Yoshi to fly off. This makes Yoshi start to panic and run around haphazardly until Yoshi is remounted or falls into an off-screen pit. Another distinct characteristic is the sounds Yoshis make. Up to and including Mario Party 3, New Super Mario Bros. Wii, New Super Mario Bros. U, and Super Mario Maker, Yoshi's vocals consist of record-scratching noises for positive interactions and whistling noises for negative interactions. In most other games like Yoshi's Story, Super Smash Bros., Mario Tennis, and every game since Super Smash Bros. Melee, Yoshi's vocals consist of high-pitched babyish squeals along with intelligible words including "Yoshi" and "Nintendo". Yoshi is voiced by Kazumi Totaka, the composer of Yoshi's Story. Yoshi carrying Baby Mario as seen in Yoshi's Island DS. The aspect of protecting babies from enemies is an important part of the Yoshi's Island games. Yoshi first appeared in Super Mario World as a dinosaur whom Mario or Luigi could ride on in Dinosaur Land. Yoshi could also eat enemies when Mario or Luigi punched Yoshi in the back of the head. This game spawned a prequel titled Super Mario World 2: Yoshi's Island for the Super NES, in which the player must control Yoshi in order to keep Baby Mario out of harm's way through the game. This led to a spin-off series of games, Yoshi's Safari for the Super NES, Yoshi's Story for the Nintendo 64, Yoshi's Universal Gravitation for the Game Boy Advance, Yoshi's New Island for the Nintendo 3DS, and a number of games for the Nintendo DS, including Yoshi Touch & Go, Yoshi's Island DS, and Super Mario 64 DS. In 2015, an original Yoshi game was released on the Wii U called Yoshi's Woolly World. Yoshi also appeared in the 2017 game, Super Mario Odyssey. Although introduced on the Super NES in 1990, Yoshi was also the star of two self-titled games for the original NES released in 1992 and 1993: Yoshi and Yoshi's Cookie, respectively. Both of these games were released for the Game Boy as well. Yoshi appeared as a supporting cast member in Mario is Missing for NES, SNES, and MS-DOS in 1993. Yoshi appeared in Super Mario 64 as a non-playable character who could be seen upon 100% completion of the game and be briefly visited after. Yoshi also appeared in the DS remake as a playable (and starring) character. In Super Mario Sunshine for GameCube, Yoshis could be ridden on by Mario in the same fashion as in Super Mario World. However, in this game, the only Yoshis available are orange, pink and purple, each of which have slightly different powers and are obtained upon bringing certain tropical fruit to their eggs. Yoshis appear in New Super Mario Bros. Wii and New Super Mario Bros. U, with each one functioning much like Yoshi did in Super Mario World, but with the added ability to use the Flutter Jump and Ground Pound like in the Yoshi's Island games. New Super Mario Bros. U also notably features the return of baby Yoshis, who were last seen in Super Mario World. Yoshi also appears in Super Mario Galaxy 2 with the Flutter Jump and Ground Pound. However, certain foods grant additional powers and change Yoshi's signature green color to the color of the fruit: the red Dash Pepper grants super speed, the light blue Blimp Fruit allows Yoshi to float upward, and the yellow Bulb Berry reveals hidden platforms. Yoshi was intended to appear in the original Super Mario Galaxy, but was removed because it would be, "too much all at once." The Yoshi species makes its Paper Mario series debut in the fifth chapter of the original Paper Mario when Mario comes across a village of Yoshis and rescues a group of Yoshi kids after they become lost in the surrounding jungle outside of the village. In the sequel Paper Mario: The Thousand-Year Door Mario rescues a Yoshi egg that hatches into a baby Yoshi, who then joins his team during the third chapter of the game and can be named upon doing so. The color of the Yoshi depends on the amount of time that passes between rescuing the egg and the egg hatching, with the timer being reset after 20 minutes have passed. Unlike in some games, the Yoshi's coloration is merely cosmetic. The Yoshi has the only attack that can damage the two Iron Clefts known as the "Armored Harriers" introduced in the same chapter (even a perfect Superguard or the "Piercing Blow" badge won't scratch them). The Yoshis appear multiple times as non-player characters throughout the Mario & Luigi series, having a whole club dedicated to them in Mario & Luigi: Superstar Saga. Yoshi and species make numerous appearances in Super Mario Maker. In the Super Mario Bros. style they have a total of five Mystery Mushroom costumes between them, based on their appearances in Yoshi's Island and Yoshi's Woolly World. In the Super Mario World and New Super Mario Bros. U styles Yoshi can be ridden, replacing the Goomba's Shoe available in the other styles. Yoshi is one of the six unlockable, playable characters in the mobile game Super Mario Run. Yoshi appears in the 2017 title Super Mario Odyssey for the Nintendo Switch, after the player has beaten the game. He is also a playable character in the crossover game Mario + Rabbids Kingdom Battle. Yoshi has appeared in nearly all of the Mario spin-off games, including every game in the Mario Kart series as a playable character (usually as a middleweight or light middleweight) and every Mario Party game to date as a playable character. Yoshis have also made appearances in multiple Mario sports games, such as Mario Tennis, Mario Golf, Mario Super Sluggers, Super Mario Strikers, Mario & Sonic at the Olympic Games. Yoshi's attributes in these games trend towards the lightweight side of the spectrum, often with high footspeed and less-than-impressive accuracy. Yoshi is the main character in the English localization of Tetris Attack. The game's single player story mode takes place in the world of Yoshi's Island, where Bowser and his minions have cursed all of Yoshi's friends. Playing as Yoshi, the player must defeat each friend in order to remove the curse. Once all friends have been freed, the game proceeds to a series of confrontations with Bowser's minions, and then to Bowser. During these final matches the player can select Yoshi or any of the rescued friends to play out the stage. Yoshi is one of the original 12 playable characters in Super Smash Bros. and has appeared in every installment since. In Super Smash Bros. Brawl Yoshi's Final Smash is called "Super Dragon", which gives Yoshi the flying and fire-breathing powers previously seen in Super Mario World. In The Subspace Emissary segment of Super Smash Bros. Brawl, Yoshi is awakened by various Subspace enemies and teams up with Link to ward them off before they both ally with the other Super Smash Bros. characters to defeat Tabuu and save the world. Yoshi has made cameo appearances in other video games. In the SNES remake of Super Mario Bros. 3 that is part of Super Mario All-Stars, one of the kings is transformed into a Yoshi. In Super Mario Galaxy, an image of a Yoshi head appears as a wooden planet that Mario can visit in the Space Junk Galaxy. Yoshi makes a cameo appearance in Donkey Kong Country 2: Diddy's Kong Quest as one of the competitors in Cranky's Video Game Heroes show. Additional video game series in which Yoshi has made a cameo appearance include The Legend of Zelda series (Link's Awakening and Ocarina of Time), and Metal Gear (The Twin Snakes and Metal Gear Solid: Snake Eater 3D). In The Twin Snakes, Yoshi and Mario are dolls that stand on a desk. When shot the Yoshi figurine plays Yoshi's signature "Yoshi!" sound clip. In Metal Gear Solid: Snake Eater 3D, Yoshi dolls replace all the cartoon-like frogs, Kerotans, which appear in all other versions of Metal Gear Solid 3: Snake Eater. Shooting all of them will earn the player the Yoshi rank at the end of the game. Yoshi was also one of the 12 initial Amiibo figurines. As part of the release of Yoshi's Woolly World, Yoshi Amiibo made out of yarn are either bundled with the game or sold separately. In addition to the regular-sized green, pink and light blue yarn Yoshi Amiibo, an 8-inch tall, green "Mega Yarn Yoshi" has been released. The animated series Super Mario World produced by DIC Entertainment is based on the game of the same name, and similar in plotline to the previous series The Adventures of Super Mario Bros. 3, and The Super Mario Bros. Super Show, except with a different setting. The show features Yoshi as a regular character, voiced by Andrew Sabiston. In the cartoon, Yoshi is a young, friendly, and fleet-of-foot dinosaur who occasionally talks in 3rd person until speaking coherent English from slightly later in the episode "A Little Learning". Yoshi is featured in the Super Mario Adventures comic serial printed in Nintendo Power, the Nintendo Adventure Books, and the Super Mario Bros. movie (taking the form of a realistic animatronic dinosaur). Yoshi is King Koopa's pet, and is referred to as a "throwback" by a gang of Koopas. He later joins Princess Daisy's side and selflessly takes a stabbing for her. However, he does reappear at the end of the film in good health. Since debuting in Super Mario World, Yoshi has received largely positive reception. Yoshi is one of the most recognizable characters in the Mario series and is featured in a myriad of Mario merchandise, such as toys, shirts, and figures. Yoshi also appeared in two of Happy Meal promotions of Mario toys, which only featured Mario, Donkey Kong, and Yoshi. In a poll conducted in 2008, Yoshi was voted as the third-favorite video game character in Japan, with Cloud Strife and Mario placing second and first, respectively. GameTrailers has created a special tribute video for Yoshi for the release of Super Mario Galaxy 2. WhatCulture ranked Yoshi at first place on their list of "20 Top Video Game Sidekicks Of All Time". Cheat Code Central listed Yoshi as the third best sidekick in video games, as well as one of the most adorable video game characters. GameSpy ranked Yoshi as the seventh best videogame sidekick, above Luigi by reasoning that only Yoshi can pull off being green and still be cool. Complex ranked Yoshi at fourth place among "The 25 Most Kickass Dragons in Video Games", adding "Yoshi would have to be one of the best sidekicks of all time". Australia's Official Nintendo Magazine called Yoshi a "cute, trustworthy, a plumber's best friend" and compared Yoshi's loyalty to that of a dog. Yoshi is ranked at 52nd place on GamesRadar's Top 100 video game heroes. The 2011 issue of the Guinness World Records Gamer's Edition ranked Yoshi at 21st place in their list of the "Top 50 Video Game Characters of All Time", making him the second highest-ranked Mario character on the list, of which Mario himself is ranked first. In 2014, Watchmojo.com ranked him #4 on their "Top 10 Cutest Video Game Characters" List. ^ Yosshī (Japanese: ヨッシー, pronounced [joɕɕiː]; English: /ˈjoʊʃi, ˈjɒʃi/) In Japan, it was once romanized as Yossy. ^ 任天堂公式ガイドブック　スーパーマリオワールド [Nintendo Official Guidebook: Super Mario World] (in Japanese). Shogakukan. January 1, 1991. p. 27. ISBN 4-09-104117-5. ^ "Iwata Asks: New Super Mario Bros. Wii". Nintendo. Archived from the original on 2010-01-24. Retrieved 2010-02-25. ^ a b "Yoshi Biography". IGN. Archived from the original on November 26, 2007. Retrieved November 28, 2017. ^ a b McLaughlin, Rus. "IGN Presents: The History of Super Mario Bros". IGN. Retrieved September 9, 2016. ^ a b c d e "A Brief History of... Yoshi". Official Nintendo Magazine. Nintendo (47): 81–83. 2012. ISSN 1836-4276. ^ a b Corrigan, Hope. "Super Mario World: Mario Was Originally Punching Yoshi In The Head". IGN. Retrieved September 29, 2017. ^ "Wii.com – Iwata Asks: New Super Mario Bros. Wii". Us.wii.com. Retrieved 2010-11-09. ^ "Super Mario Bros. The Movie Archive". Smbmovie.com. Retrieved 2010-11-09. ^ "Super Mario Bros. The Movie Archive". Smbmovie.com. 2009-03-30. Retrieved 2010-11-09. ^ "Mario is Missing! for NES". MobyGames. 2003-09-26. Retrieved 2010-11-09. ^ Chester, Nick. "Back in the saddle with Yoshi in Super Mario Galaxy 2". DESTRUCTOID. Retrieved September 9, 2016. ^ Ishaan. "Yoshi Originally Intended For First Super Mario Galaxy". SiliconEra. Retrieved September 9, 2016. ^ Rob Burman and Matt Casamassina (2007-03-28). "IGN: Mario and Sonic Together at Last". IGN UK. Wii.ign.com. Archived from the original on 2007-04-06. Retrieved 2010-11-09. ^ deLooper, Christian (29 August 2014). "Mario, Yoshi, Pikachu, Link just four of 12 characters arriving via Nintendo 'amiibo'". TECHTIMES.com. Retrieved 30 November 2014. ^ "Yoshi's Woolly World Bundle". ^ "Attention: Nintendo is making a 'giant' version of the Yarn Yoshi amiibo". ^ a b "20 Top Video Game Sidekicks Of All Time". Whatculture.com. 2011-09-23. Archived from the original on 2012-01-02. Retrieved 2011-12-30. ^ "McDonald's: Take the Mario Challenge – Raving Toy Maniac". Toymania.com. Retrieved 2010-11-09. ^ "And Japan's Favorite Video Game Characters Are...?". Kotaku. 2008-08-12. Retrieved 2009-09-12. ^ "Super Mario Galaxy 2 Video Game, Life And Times Of Yoshi | Game Trailers & Videos". GameTrailers.com. 2010-05-20. Retrieved 2010-11-09. ^ "Top 10 Video Game Sidekicks – Cheat Code Central". Cheatcc.com. Retrieved 2011-12-30. ^ "Top Ten Videogame Sidekicks – Page 4". GameSpy. Archived from the original on 2004-06-16. Retrieved 2011-12-30. ^ "The 25 Most Kickass Dragons in Video Games". Complex. 2012-02-03. Retrieved 2012-07-30. ^ "100 best heroes in video games". GamesRadar. ^ "Top 50 video game characters of all time announced in Guinness World Records 2011 Gamer's Edition". Gamasutra. Think Services. February 16, 2011. Archived from the original on December 7, 2012. Retrieved April 20, 2013.